The Clash Royale tournament scene has grown to epic proportions just six months after the game’s global launch. As Supercell revamps and simplifies in-game tournaments, community organizations like Hammers eSports, Super Magical Cup, and Royale Premier League have brought additional depth and complexity to competitive clashing. The explosive conclusion to the first season of Clan Royale League offers us a chance to reflect on the development and execution of top-level, clan-based gameplay. Hammers Multimedia launched Clan Royale League (CRL) on Mobcrush in late July. The support of sponsors Mobcrush and FreeMyApps enabled the League to offer a total prize pool of $1600! Two months of gameplay were broadcast by veteran commentators abrownbag and st1ck8ug. Eight top-ranked teams met in the arena to compete in a carefully structured format that included group and bracket play. Clans were also able to pick one card per match that would be globally banned by all ten players. Teams strategically banned cards to frustrate their opponents’ ability to build well-rounded decks, while attempting to mitigate the weakness of their own decks. This reduced the importance of in-game skill by shifting emphasis toward preventing opponents from using their preferred deck archetype. The decision by ClashWars to ban Giant in each of their playoff matches allowed them to avoid the dominant metadeck used in ladder and tournament play. This ranking was extremely important as it determined the structure of the playoff bracket as well as which clan had the right to the second card ban, a privilege which they retained even if their opponent claimed a position of advantage by upsetting a higher-seeded team. Top-seeded teams were matched against weaker opponents and leveraged their ability to ban second in order to gain the upper hand. For example, ClashWars players who reached the finals with X-Bow decks first banned Giant to give their siege setup a better chance to connect with the tower. Their opponents Clout Gaming responded by banning the X-Bow outright, nullifying the choice by ClashWars. As a ClashWars team Captain, I worked with ClashWars founder August to determine our team lineup and select card bans for each week. We made these decisions based on past performance and contributions made by our team members at weekly practice. Our lineup consisted of many tournament veterans and highly accomplished players, including performances from Patriots, Boom, Heals, Xhadian, Justin, Syztum, Slayer, and Miniminter. As the bottom-ranked team from the Barbarian Division, ClashWars had an uphill fight through every match as we pursued a first-place finish. By virtue of their seventh-place seeding, ClashWars was first paired against a juggernaut from ladder and tournament play, second seed Nova eSports. ClashWars initiated the ban-draft process by eliminating Giant from selection, while Nova chose to ban Zap. The decision to ban such a popular card had also been considered by the ClashWars team, leading them to practice without it for several weeks. Watch the series here! Patriots34 and boom! made huge connections early in their matches against GovoG and HW, respectively. Dropping X-Bows immediately after the start of the match, the ClashWars members caught their opponents off guard early in their games and successfully held their tower damage advantage throughout the matches. Playing a control-heavy deck, Patriots leveraged great use of spells to shut out his opponent 1-0. Boom! suffered one tower loss, but aggressively dropping X-Bows to earn chip damage and Inferno Towers to block oncoming Lava Hounds gave him the 2-1 win. Heals pumped elixir to an early advantage against IDestroyYou. After IDestroyYou responded with an Elixir Collector of his own, Heals surprised his opponent by sending a Miner to the same side as the pump, but directly onto the tower. Viewers learned to #RespectTheLog when it came crashing down on a massive army comprised of Barbarians, a Hog Rider, and Archers. The weakened troops were chopped up by Heals’ Mini P.E.K.K.A after his opponent freezes a defensive Inferno Tower. IDY played a great defensive game after that, but could not manage to comeback and knock a tower down. Xhadian got amazing value defending with Ice and Fire Spirits, earning early poke damage with his Miner against Arcturus Light. The heavy double-prince deck from Arc struggled to build a counterpush while responding to poke. Constant harass from Miner and Hog pushes whittled his tower down for Xhadian to claim a 1-0 less than a minute into overtime. Miniminter demonstrated his mastery with the Hog Trifecta deck archetype. Valkyrie and Musketeer helped Mini build a massive elixir advantage against Nova despite suffering a Miner-Minion Horde attack in mid-game. Miniminter’s Log and Poison get immense value against the chip damage deck from Nova. ClashWars demonstrated excellent gameplay in this series, and with this 5-0 sweep advanced to the semifinals. ClashWars began their semifinal ban-draft by once again ruling out use of Giant. Crucible Wrath banned Miner to protect their Elixir Collectors and prevent ClashWars from earning the chip damage they scored against Nova. Watch the series here! Justin’s first push against Connor was shut down by an early Bowler, but his split push into the opposite lane with a Hog Rider earned him a ton of tower damage. Justin forced innefficient trades the whole game and earned additional chip damage with his masterful Princess and Poison play. The game narrowed to a very close edge for Justin, who was within range of destroying his opponent’s first tower in overtime with a Poison + Zap combination. A misplaced Zap by Justin put Connor back in the game and within one Hog strike of winning, but quick cycle and fast fingers gave Justin the 1-0 win by a nose. Syztum developed a massive elixir advantage with his pump and no Miner in sight. VizardNs deflected an early Hog Trifecta push with a perfectly positioned Inferno Tower and Bowler defense. However, with an Inferno Tower placed too far from center, Syztum recognized his chance to strike and punished with a Hog Rider sent to the opposite side. Still, constant tick damage from Poison & Hog attacks helped VizardNs bring the game to a virtual draw at the start of overtime. Inferno Towers blocked all of Syztum’s Hog attacks, but Vizard couldn’t evade the spell damage directly on his tower. VIzard started the spell damage race too slowly, but caught up with a crucial Hog strike. Syztum claims the game 1-0 by dropping his opponent’s weakened Inferno Tower with a trifecta push and nailing the tower with Hog. Patriots34 sought a 3-0 shutout with his dominant X-Bow play. An unending Rocket barrage from Muffin destroyed every X-Bow, but each exchange left a sliver of health on the X-Bow sufficient to give Patriots a 372 damage advantage. The Inferno Tower proved its effectiveness at dropping mid-sized pushes of slow, high hitpoint units. In addition, Ice Spirit and Mini P.E.K.K.A were an incredibly effective defensive combination against ground pushes. Defensive Guards from Patriots eventually wandered toward his opponent’s tower and dealing a ton of chip damage, eventually bringing the tower within range of a Lightning finish. This gives ClashWars a 3-0 sweep and sends them to the finals! With Synergy’s triumph over Crucible Wrath for the third-place finish, the only two clans left in contention were ClashWars and Clout Gaming. ClashWars banned Giant one final time, and Clout Gaming surprised the commentators and viewers by choosing X-Bow. This denied ClashWars one of their favorite cards in the playoff matches leading up to the finals. Watch the series here! Justin began the finals series against Clout’s Rigel A. Elixir Collector play on both sides of the arena led to massive clashes in this match. Justin’s Poison efficiently dealt with opposing Three Musketeer plays, but Rigel A earned an early damage and elixir advantage. Short on defensive options, Justin could not support his Lava Hound and was left flat-footed with a series of awkward, inefficient counters. Tricky Miner placement by Rigel A earned frequent connections with his intended targets and allowed him to seal the deal with constant pressure from his Three Musketeers and Miner/Poison harassment. Boom! followed up on his strong quarterfinal performance by being placed second in the lineup against Kr from Clout Gaming. Both players began the match by bleeding at 10 elixir, refusing to make an initial commitment. Early rockets on his opponent’s tower allowed kr to develop a tower damage advantage. He followed up with great chip damage and elixir-efficient defense with perfect Guards and Ice Spirit placement. Kr launched a Miner and sent a prefire Rocket to support it, earning an amazing connection against his opponent’s careful, defensive posture. As time ran out, Kr pushed his damage advantage with a rocket duel to finish the game with a 1-0 advantage. Woody took the stage, seeking to reverse the momentum against Clout’s third player Rice. Early use of Ice Spirit and Poison by Rice created an opening for Woody deploy a devastating Miner-Minion Horde attack. Guards placed to distract the Minion Horde didn’t draw them away and Rice lost a tower in the first 45 seconds. Spear Goblins and Mini P.E.K.K.A protected the pump placements from Miners to allow Woody to maintain his elixir advantage. A late-game push by Rice nearly put the game into overtime, but with Poison out of rotation, Rice lost his second Arena Tower to a Minion Horde-Mini P.E.K.K.A push for a 2-0 finish in Woody’s favor. Syztum returned to the finals with his signature Hog Trifecta deck. He gained an early advantage against AwDaSea with a Hog-Poison strike and recouped his elixir disadvantage with a well-protected pump. His efficient defense against a Lava Hound push using Musketeer/Poison enabled a devastating counterattack with his Hog Rider. Tombstones deployed by AwDaSea didn’t distract the Hog Rider long enough to prevent it from connecting with the tower. Syztum’s 1-0 win brought the series to a 2-2 draw. Patriots and EsoPa began Game 5 with slow, defensive Elixir Collector play. EsoPa’s Miner didn’t connect with the pump, as a defensive Mini P.E.K.K.A from Patriots brought him down fast. Lacking any way to swarm his opponent, EsoPa suffers a Poison on his Elixir Collector and has no immediate way to punish the spell cast. A proactive Bowler from EsoPa is countered by Pats with a Miner-Guards split push that meets little resistance. Patriots uses masterful Inferno Tower and Ice Wizard deployment to gain a damage lead while executing elixir-efficient defenses. The Miner&Poison combination from Patriots cannot be stopped, and the constant ticking damage allows him to claim the 1-0 victory. Xhadian seeks to close out the finals with a nimble Hog cycle deck utilizing the “Payfecta” defense (i.e. Miner, Princess, Ice Wizard). Electrify punishes Xhadian’s proactive Mini P.E.K.K.A by pushing with a Hog Rider of his own in the opposite lane–a missed Cannon deploy by Xhadian forces him to drop Guards to prevent the Hog from destroying the tower. No defensive building in Electrify’s deck means he cannot counter Xhadian’s Hogs, and a lack of any spell besides Zap allows Xhadian to build an oppressive field advantage with 3 princesses. One last Hog/Miner attack early in overtime gives Xhadian the 1-0 and clenches the series 4-2 for ClashWars. Running any tournament series on this scale requires a high level of coordination and a depth of experience in competitive gameplay. Hammers Multimedia was up to the challenge and expertly executed the first season of Clan Royale League with relatively few troubles. Joined by an all-star group of highly competitive teams, CRL Season 1 made for some of the best Clash Royale gameplay in the community. Going forward, it is my hope that other organizations will be able to emulate the success of the Hammers team. In addition, tweaks and clarifications to the set of rules used by CRL would benefit the clans and players by providing a more predictable gaming experience for the players. As team rosters shifted during Season 1, the CRL management maintained a high level of communication that helped keep the focus on the next week of matches, and away from any distractions. This helped immensely, but having a codified set of rules and expectations for team continuity and composition would help greatly. Finally, it is my personal hope that CRL does away with card bans in the seasons to come. The core of their appeal is competitive, team-based strategy. Shifting focus away from in-game performance comes at a detriment to players who practice for weeks using their preferred deck archetype, and does a disservice to viewers who demand games featuring the highest level of gameplay. 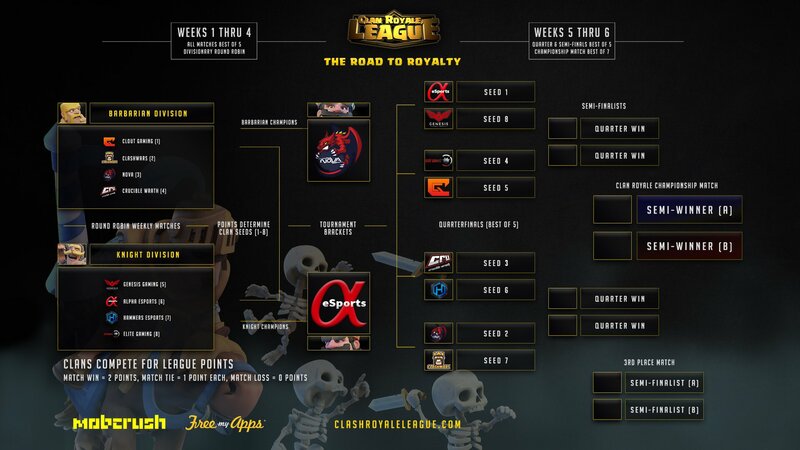 Overall, Clan Royale League represents one of the community’s best hopes for competitive, team-based Clash Royale gameplay. It was my honor to serve as one of the captains along with August of the victorious team ClashWars, and I appreciate the opportunity provided by Hammers eSports to compete at such a high level of play. I look forward to even bigger and better events in the months to come. See you in the Arena! Woody is the Leader of the Global Top 100 clan Reddit Alpha, and he was a Captain of the ClashWars team, champions of Clan Royale League Season 1. Follow him or Twitter and tune in to his Twitch stream!